Unlike most types of arthritis, gout is a condition with known causes. It appears when large amounts of uric acid deposits in the joints, making it impossible for the body to eliminate it on its own. However, with this article we hope to advise you on how to treat gout effectively and eradicate this painful and distressing condition. Complete treatment for gout involves physical therapy, medication and home remedies. Due to the fact that gout is often triggered by various foods – such as yeast, gravies, organ meats and alcohol – elaborate research is being undertaken to find effective ways of neutralizing the uric acid, which accumulates within the joints. In other words, if you wish to start your treatment at home, you can do so by including fresh fruits (such as cherries, citrus, bananas and blueberries), fresh water, and tea and fruit juices in your daily meals. Also, limiting the consumption of the before mentioned foods that cause uric acid accumulation. 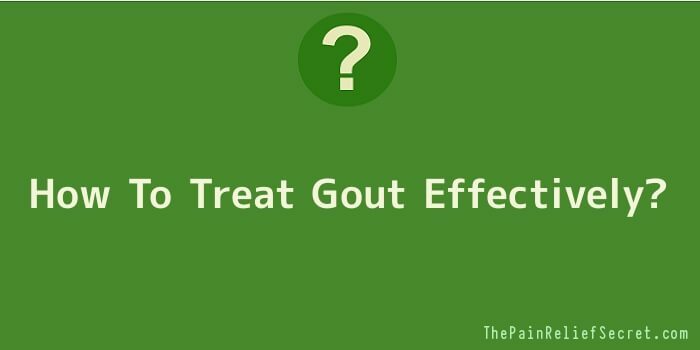 Gout diet is another method you can try as it can have a dramatic effect on this condition. Last but not least, if no other gouty arthritis treatment works, surgery is an option. The procedure is rarely suggested by doctors and only when all other options have been proven ineffective against the excruciating gout pains. Gout surgery usually consists of the removal of the nodules that form within the joints. These nodules (tophi) need to be removed as soon as they have been identified, or else there is a risk of serious infection.